What is a Prospector Tent? A Prospector Tent (or “wall tent”) is a large tent with high walls, designed to fit several people and a lot of gear. 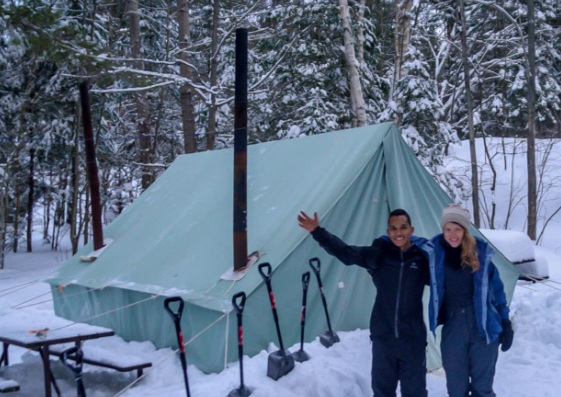 In the winter, these tents are a great way to enjoy the outdoors, because they can be fitted with wood burning stoves that can keep them warm throughout the night. A Prospector Tent fully set up with two stoves. Prospector tents are often made of canvas, with either wood or metal poles that can be mounted on the interior or exterior of the tent. There are many designs, and some even include plastic windows. Because the tent is basically just canvas and a supporting structure, people can opt to make their own, following designs found online, or by their own imagination. If you are looking to buy a prospector tent, they are available on sites like kijiji, and in specialty stores. The cost is in the $800+ range, although you can find something much less expensive on kijiji, or again, you can try making one on your own. They can accommodate wood burning stoves, which allow them to be heated!